As older adults, many baby boomers are understandably hesitant to start a new exercise routine. Retired seniors may have more time to pursue your interests, but they are also more likely to have chronic illnesses that may be barriers to activity. Thankfully, there are still ways to stay active and maximize your health even if you suffer from a chronic pain condition like arthritis. Here are some things you should know. Ask any doctor and they will applaud the benefits of exercise. Of course, every activity comes with a risk, and twisted ankles, sore backs, and other aches and strains are risks you face when you exercise. However, for most people, the benefits of exercise outweigh the risks. According to the Arthritis Foundation, individuals with osteoarthritis can benefit from exercises that strengthen muscles and increase flexibility. This is because strong muscles can better support and protect weakened joints. Meanwhile, flexibility exercises can help maintain a joint’s full range of motion. For older adults with heart-related health issues like hypertension, exercise helps strengthen the heart and lower blood pressure. Exercise also aids weight loss, another factor that lowers blood pressure. 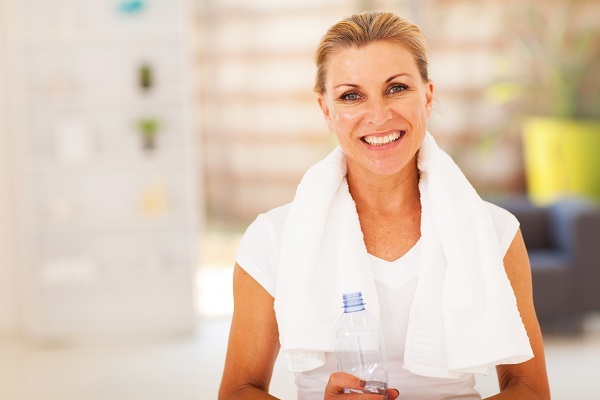 However, patients should consult with their doctor before beginning a new exercise regime so they don’t over-exert. It’s no surprise that exercise plays a large role in treating diabetes. The American Diabetes Association states that aerobic exercise (the kind that gets your heart rate up) helps your body use insulin more effectively, lowers blood glucose levels, lowers blood pressure, and improves cholesterol levels. A Cochrane study concluded that although more research needs on the impact exercise has on chronic pain, there is evidence to support that exercise does not cause harm and may reduce pain severity while improving physical function. However, it’s still a smart idea to take precautions before engaging in a new form of exercise. If you suspect you may have an underlying, undiagnosed health problem, talk to your healthcare provider. Don’t put off visiting the doctor. An early diagnosis may mean a better prognosis. Secondly, don’t neglect your other treatments. This means eating well, taking your prescribed medications, and getting adequate rest. Stress is also something you should take care of – you likely know by now that retired life carries unique stresses. If, for example, you are struggling financially to afford your healthcare costs, take advantage of senior discounts and local senior advocacy organizations that may offer health programs. If you require regular medication, buy from international and Canadian pharmacy referral services like Rx Connected and Canadian Med Center – countries outside the U.S. may have significantly cheaper drug prices. Fortunately, you don’t need fancy equipment to exercise, and a simple walk in the park is absolutely free! Besides, taking care of your health now to prevent illness later can significantly offset potential healthcare costs. People lose strength, flexibility, and endurance as they age. This is normal, but this shouldn’t restrict you. There are plenty of exercises you can do that are minimal-risk and low-impact. Aquatic exercises such as water aerobics and swimming are easy on the joints. Being free of gravity means you have less weight on delicate limbs, minimizing pain for arthritic individuals. For folks who can manage doing so, weight-bearing exercises are great for protecting against osteoporosis. While not restricted to women, older women with thin frames are more at risk for osteoporosis. You’re not limited to lifting weights; hiking is also an effective weight-bearing exercise. Other low-impact exercises include cycling, walking, rowing, and tai chi. Talk to your doctor before starting any new exercise routine, especially if it’s intense or if you have a chronic health condition that may affect your ability to be active. Your doctor may recommend safer and more effective alternatives. Start slow. You don’t need to go full-throttle to reap the benefits of exercise. Any number of minutes, even 5-10 minutes of movement, is better than none! Wear protective gear if you’re engaging in higher-risk activities like biking and skiing. Older adults are less resilient to broken bones, dislocated limbs, and concussions. You don’t want a single mistake to keep you from staying active. Exercise with others. Having an exercise partner not only safeguards you if an accident happens and someone needs to call for help; having company is simply enjoyable. Chronic illness, age, and even painful conditions shouldn’t impede your ability to go outside, get active, and get moving. You can start proving today that age will not slow you down! Exercise provides seniors with too many benefits for to be skipping out on it!